This list has been compiled over several years by Lynne Irving. She says: “My information came firstly from family because of a great uncle and his pals who were in the Tyneside Irish. I came across an old photo of a young soldier in my grandparents wardrobe, I asked who was this person then the whole story began. There was also a huge 'penny' which stood on the hearth which had his name on. From then began an obsession. I have dragged my husband to France and around cemeteries in Durham and Northumberland many many times following the history of Tyneside Irish 24th Battalion. I am working on a list of officers and will send it on to you in due time." 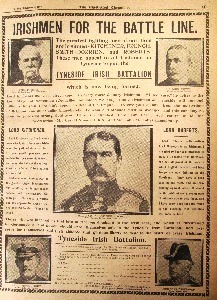 See also Hughes, C.A., Pte., 1916 which has the story of the 24th Tyneside Irish attached. Barker, G.D.; Pte. ; 24/1302; Transferred to 30th Bn. Depot. Barr, R.; Pte. ; 24/1702; Cycling Coy. Charters, Peter; L.Cpl. ; 24/884C; Gateshead; died 1st July 1916; took part in trench raids 5/6th 25/26th June 1916; bomber 9th Batt. Chatt, J.W. ; Pte. ; 24/962C; Felling; Transferred to Gun Corps. Flynn, Jas. ; Pte. ; 24/702B; Tanfield; Transferred to Medical Corps. Gilroy, Jas. ; Pte. ; 24/230D; Gateshead; Trans. to Yorkshire L.I. Jackson, R.; Cpl. ; 37635; Shiremoor; died 28/04/1917; named on Arras Memorial. Miller, J.W. ; Pte. ; 24/439B; High Felling; Transferred to D.L.I.